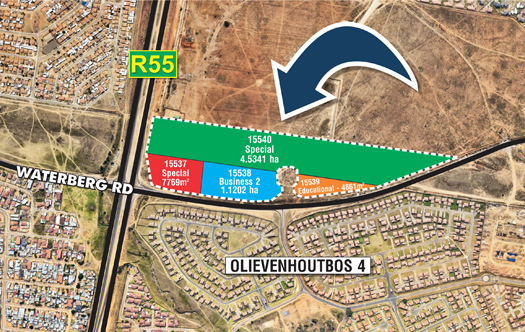 Situated on the north-eastern corner of the intersection of the R55 and Waterberg Road in Tshwane, Centurion close to Midrand. The R55 forms an access interchange with the N14 to the north. It is a link between Pretoria West and Johannesburg. A feasibility study conducted by WSP in May 2015 indicates that the site can potentially pump 260 000 litres in the 1st year of operations, 300 000 litres in the 2nd year and 325 000 litres in the 3rd year. These projections should be deemed acceptable to most fuel companies.